English politician; born in London 1870; youngest son of Edwin L. Samuel, and nephew of Sir Samuel Montagu. He was educated at Balliol College, Oxford, where he took first class honors in history and the degree of M.A. in 1897. At Oxford he was president of the Russell Club, and in 1895 he stood unsuccessfully as a candidate for South Oxfordshire in the Liberal interest. In Oct., 1900, he again contested this seat unsuccessfully. In 1902 he was elected as a Liberal for the Cleveland division of the North Riding of Yorkshire. 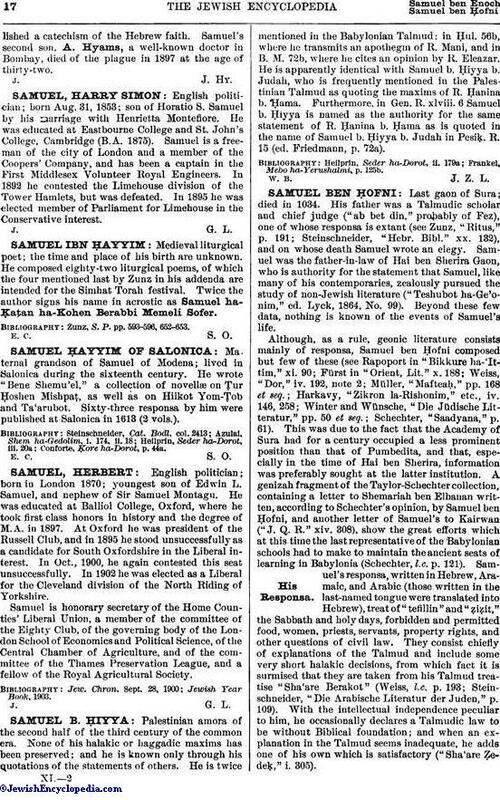 Samuel is honorary secretary of the Home Counties' Liberal Union, a member of the committee of the Eighty Club, of the governing body of the London School of Economics and Political Science, of the Central Chamber of Agriculture, and of the committee of the Thames Preservation League, and a fellow of the Royal Agricultural Society.